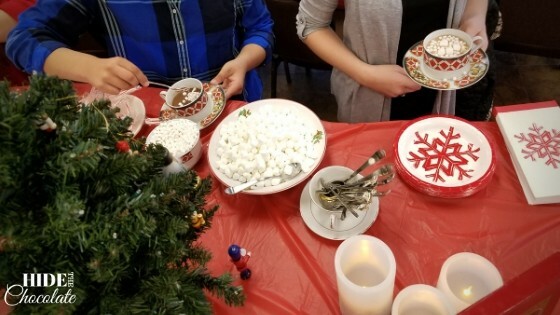 Hot cocoa, marshmallows, and cupcakes mixed with a little holiday poetry were all we needed for a fun-filled Christmas Poetry Teatime! Recently we hosted our monthly poetry teatime at the local library. We pulled out our favorite Christmas poetry books like: The Night Before Christmas, How the Grinch Stole Christmas, A Vintage Christmas and Penhaligon's Christmas Treasury. This month we had a different option for drinks instead of tea. The kids enjoyed hot cocoa with marshmallows. 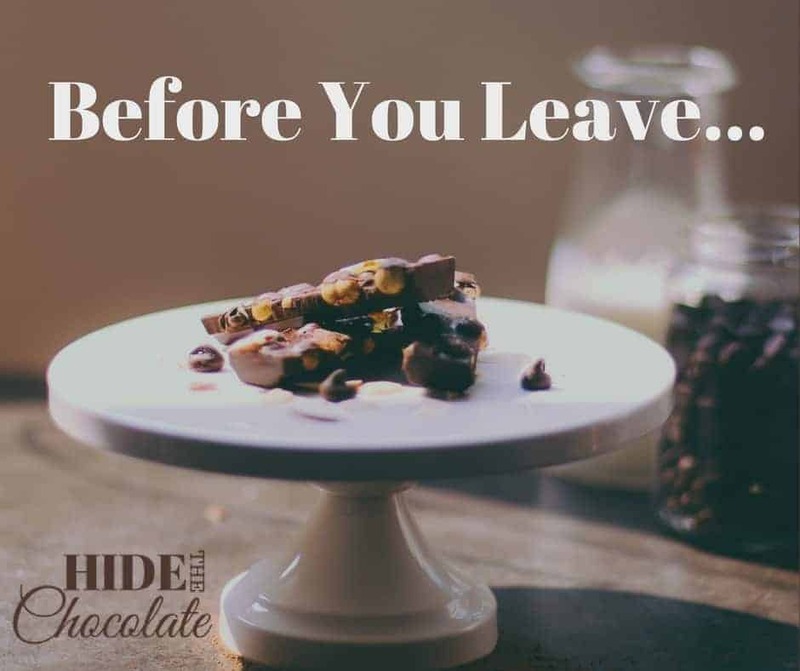 We used our Mexican Hot Chocolate recipe but left out the spice because of the younger kids. 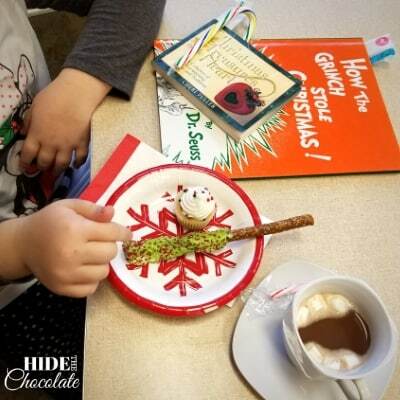 A few candy canes were added for a peppermint twist on our hot chocolate. 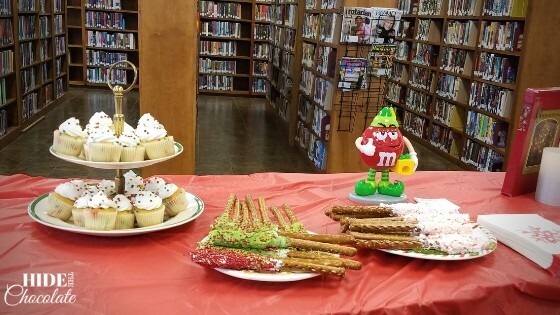 For snacks, some of the moms brought Christmas cupcakes (the kids loved the sprinkles) and candy-coated pretzel rods. We also had treat bags that some moms brought as an early Christmas present. With all the craziness of the holidays, I wasn't prepared for elaborate decorations. 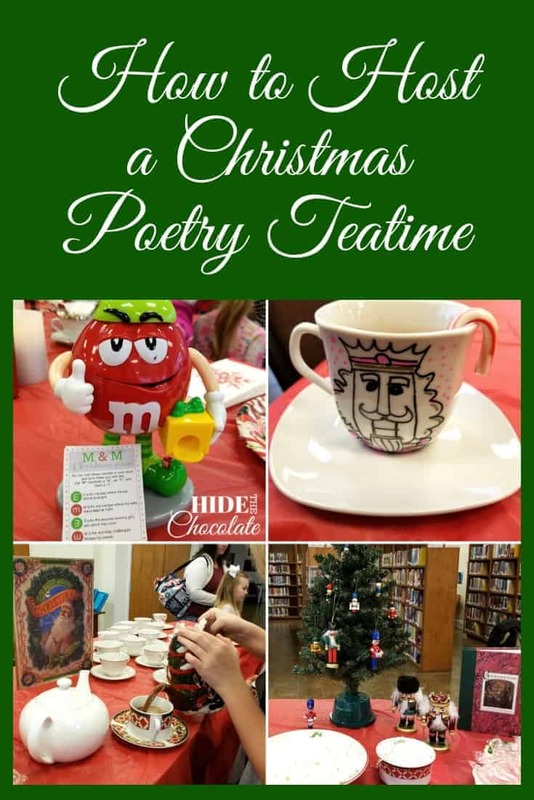 So, I grabbed a mini Christmas tree, some of our favorite poetry books and our Christmas teapot and cups. The kids didn't seem to mind. They were having too much fun adding marshmallows to their cocoa! 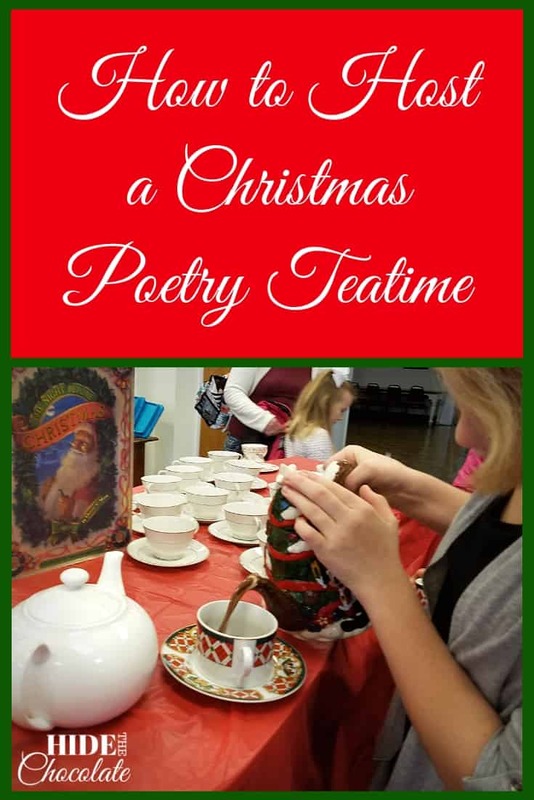 We started our Christmas poetry teatime in the traditional way. 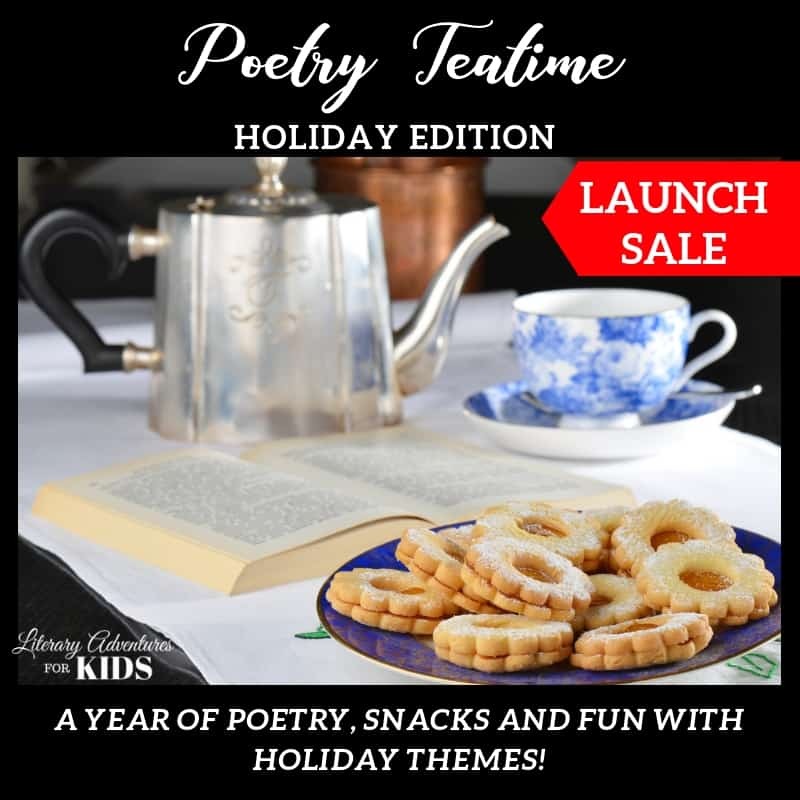 While eating snacks, the children read their favorite poems. Some of the poems were from books, but some of the children wrote their own to share with their friends. Then we began our writing activity. This month we practiced our observation skills with an activity known as Keen Observation. 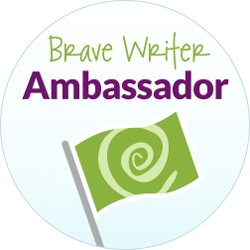 According to Julie Bogart of Brave Writer, the purpose of Keen Observation is "to give your kids the chance to get to know a concrete object before they write. 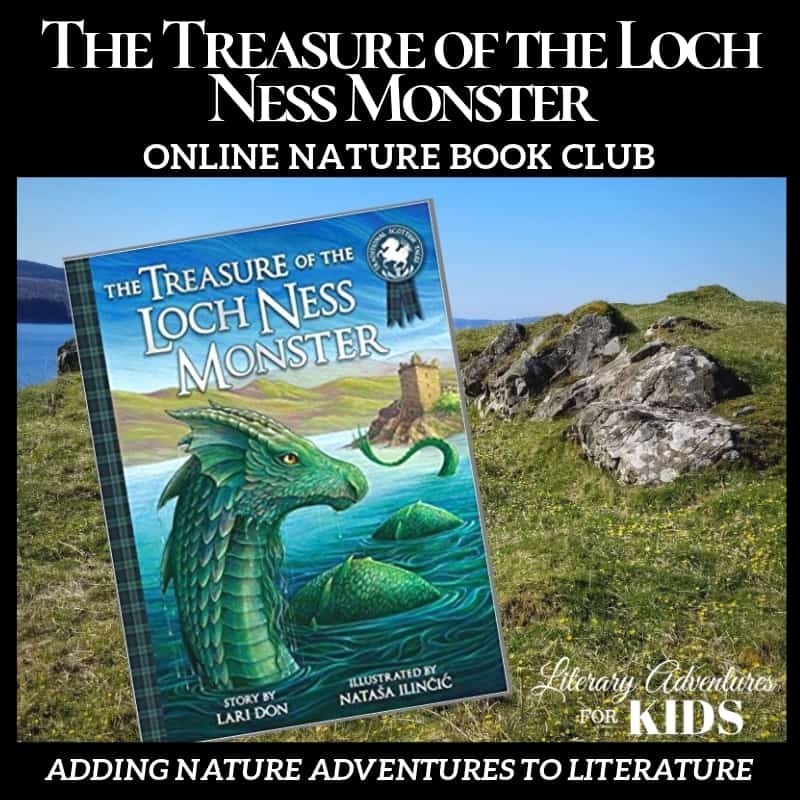 They'll examine that object with enough attention to detail to write about it." We started our observation by passing around a strange ball. The children used all of their senses to observe the ball and write words that described it. What colors do you see? Do the colors change as you move the ball? Do they reflect? What shape is it? Is it symmetrical? How does it feel? What texture is it? Is it hard? Is it soft? Does it remind you of anything when you touch it? When you smell it, what memories does the scent bring up in your mind? Does it make a sound when you shake it? What if you drop it on the table? These questions answered the Sight, Touch, Smell and Sound senses, but we still needed to observe the Taste sense. So, I dropped the ball into a teapot of boiling water. Like magic, it transformed into a beautiful flower. And we were able to taste the odd-looking ball which was, in fact, a blooming tea. The children used their descriptive words to write poems. 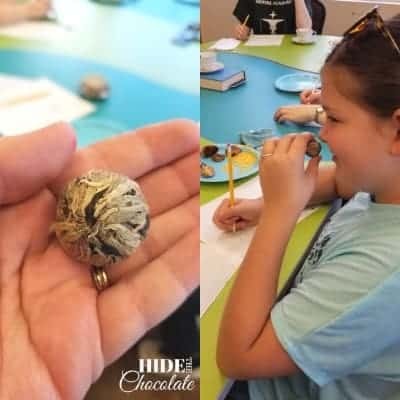 Though we have many who are reluctant to write, they were told that, at a minimum, they would need to write sentences describing the flowering tea. After several minutes, many of the children had written poems, descriptive paragraphs or sentences. Most importantly, they had exercised their minds to truly observe an object. For homework, they were told to observe their surroundings at home. As a result, I now have poems about mystery objects all over our school room table. 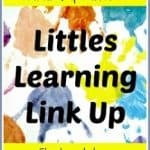 Have you tried a keen observation activity? What other objects have you used? Thank You for sharing this, Dachelle. You’ve inspired me to do a Christmas Poetry time. YAY! Do it, Anu! You’ll love it! 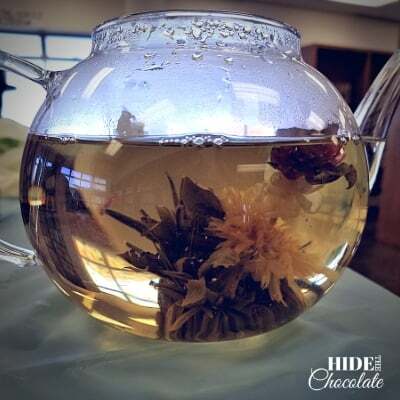 Where did you find this flowering tea? 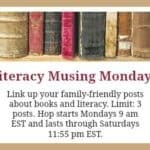 I would love to try this activity with my children. I ordered mine off Amazon. Here’s the link. https://amzn.to/2Sv12Ub I need to add them to the post. Thanks!